GATE 2017 Answer Key (उत्तर कुंजी), Question Paper Solutions (प्रशन पत्र सलूशन): GATE Exam 2017 held on February 4th, 5th 2017 and February 11th, 12th 2017. 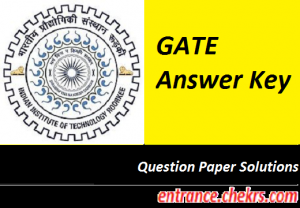 IIT Roorkee the exam conducting authority of GATE 2017 has published the GATE 2017 Question Paper Solutions on its official website. Aspirants can check their marks by evaluating with the answer key i.e. available by IIT Roorkee. The releasing date for the GATE Answer Key 2017 was 27th February 2017 but IIT Roorkee released the key a day before the given notification i.e. 26th February 2017. Aspirants can check their answers and can download the key from the links given below in this article. There are many coaching institutes which released the predicted answer key for GATE 2017 on their pages. Institutes like Made easy, gate forum etc. are trustworthy institutes, the candidates can also check their answers with the answer keys released by the institutes. GATE is also known as Graduate Aptitude Test in Engineering is a test which held in the month of January and February for different streams. The exam authority for GATE is IIT Roorkee. This exam is conducted for the students who desire to do their post-graduation in engineering from reputed institutions. Now these days, PSUs also recruits through GATE scorecard. Aspirants have an opportunity to Challenge GATE 2017 Answer Key. The official date to challenge the answer key is from 3rd to 6th March 2017.For the challenging of the answer, key aspirants have to login into the GATE Online Application Processing System (GOAPS). The aspirant from India have to pay Rs.500 and aspirants from outside India have to pay US$10 for every question they want to challenge. The payment will be done in the online payment portal given in GOAPS for challenging the answer key. The aspirant has to select the question number carefully from the paper and they also have to describe why they are challenging that questioning the challenge become succeed the money for that question will be refunded. The final decision will be taken by The GATE 2017 Committee. IIT Roorkee has also published GATE 2017 Question Paper on the official website. Aspirants can download the question paper pdf from the official portal of GOAPS. Aspirants can also download the GATE 2017 Solutions from the website to check their answers. The Answer key has been released on 26th February 2017. There are some simple steps to download the pdf from the website. They just have to access the official website and click on the link for the GATE 2017 Question Paper Solutions given on the website. The official answer key for GATE 2017 has been released by IIT Roorkee. Candidates can download the GATE 2017 Answer key from the official website i.e. hgate.iitr.ernet.in/. According to GATE 2017 Marking Scheme for each one mark questions they will be rewarded one marks and for two marks question, they will be given two marks. There will be a deduction of one-third marks for each wrong answer. The numerical question doesn’t have any negative marking. There are lots of benefits of the GATE 2017 Answer Key. It will help the candidates to raise their ranks in GATE 2017 and as well as it will help them to clear the cut-off marks.